There are several genres of stores that frequently host Contract Postal Units (CPUs): pharmacies, self-storage facilities, and hardware stores come to mind. 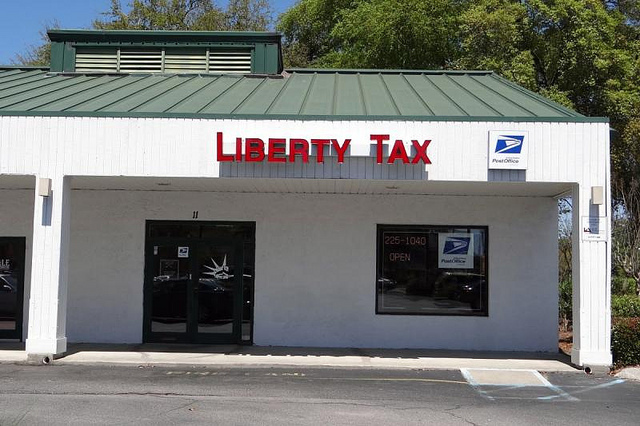 How about tax service stores? 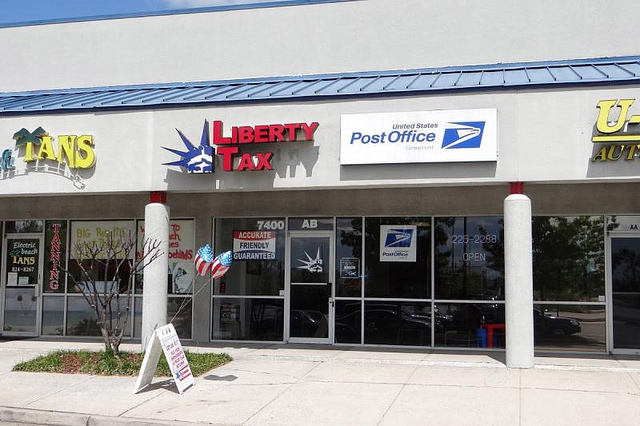 During April you can finish up your taxes and Certify your returns all in one location. During the rest of the year the CPU builds relationships and keeps foot traffic coming through the door. 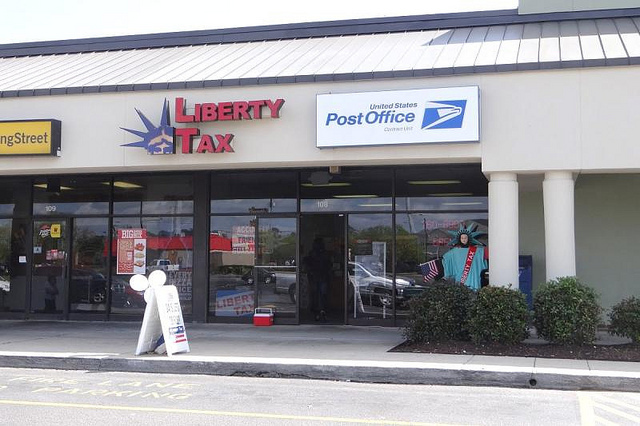 One couple owning a handful of franchise of Liberty Tax Services operations in Charleston has turned this marriage into an art form. You've seen folks hawking $5 pizza specials on street corners waving their arrow signs; how about a sign for a post office that's open during Federal holidays? 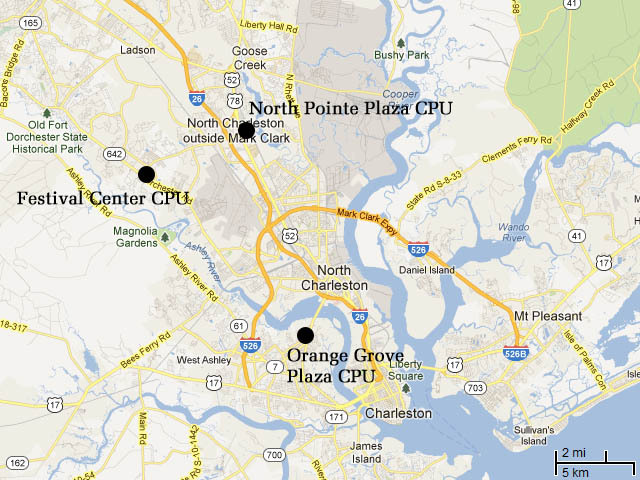 The author didn't witness that live, but these folks have done it, and are very devoted to their CPUs. They've even got their Google Maps bases covered when it comes to being listed as a post office; many operators do not implement their business listings correctly. Outside, each of the three operation is identifiable as a CPU by one or two "United States Post Office // Contract Unit" signs. Inside, the CPU operations, collection box, and associated signage are beautifully implemented within the store. 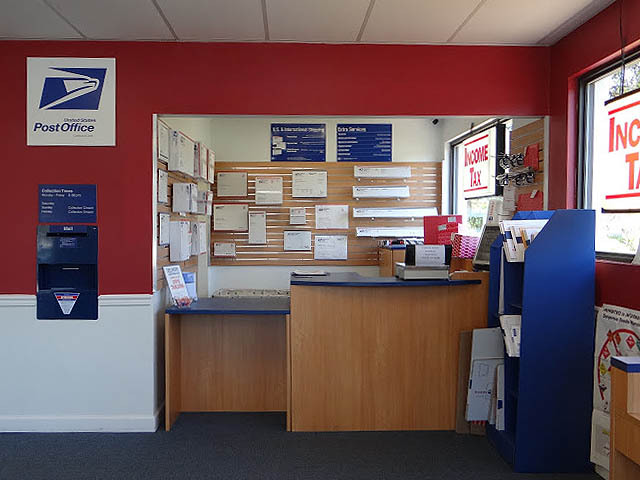 The new-style wood-grain CARS computer unit counter is inviting, and the Postal Service's new horizontal 'slatted' design presents all your box options in the back. A similar counter on which one can fill out forms is located to the side. These operations were implemented with the utmost care. Kay Hastings, co-owner, told me "Our goal is that it takes you longer to park than it takes you to get in and out." I was very impressed by the stamp selection that each of the operations had available. The CPUs were stocked with commemoratives, and even had the special-order Lady Bird Johnson stamps, which were introduced last November, available. Very few operations, anywhere, have got those! I purchased three panes. Here are photos of the three operations.